Nico Rosberg is confident he still has the edge over his Mercedes team-mate Michael Schumacher, despite the seven-time world champion closing the gap in 2011. Rosberg scored nearly double Schumacher's points tally in their first year as team-mates in 2010, but the gap was just 13 points at the end of last season. 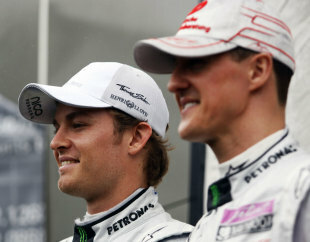 However, Rosberg, who still beat Schumacher 16-3 in qualifying over the course of the year, is not concerned. "He closed the gap to me in the championship standings compared with 2010, but a lot of that reduction was down to the tyres and the DRS, which made overtaking more possible," he told the February issue of Car magazine in an interview alongside Mika Hakkinen. 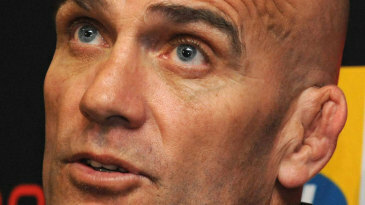 "Qualifying lost a lot of its importance in 2011 and that was the main explanation. But Michael also raised his game; he upped his performance." He added: "At the start of last year I had a lot of respect towards him, but it's settled down now. We're on an even playing field and it's much more easygoing. I respect his dedication to the sport and his approach. That's interesting to see." Rosberg has now competed in 108 grands prix without a victory, but he insists he is not fretting about his career statistics. "I get a lot of pleasure from the races in which I know I've done a good job, like finishing sixth in Abu Dhabi," he said. "I know my time will come, when I have the right car. I really look forward to winning because I know it will be an amazing experience, but it's not like I'm suffering in any way at the moment."